At First Baptist Church you will discover a group of real people dedicated to following our Lord and Savior, Jesus Christ. It is our first priority to help you find a place and get plugged in and connected. 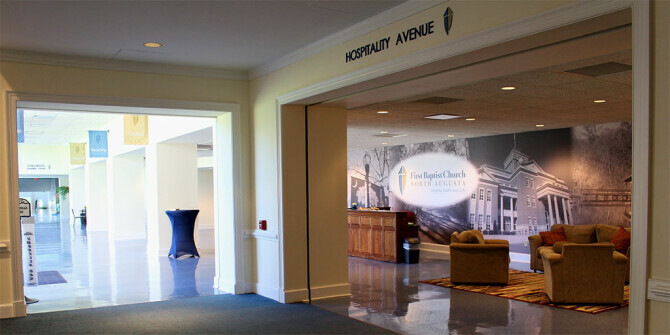 Located in the Atrium outside our Worship Center, a cup of coffee and a relaxed atmosphere is waiting for you. Each Sunday, our team members are ready to help you find your place. A spot is reserved just for you this Sunday! Guest parking is located beside our Worship Center on Georgia Avenue. Come as you are. You will see people wearing anything from a t-shirt to a coat and tie.